Some memories are unforgettable and they remain vivid especially when related to food; it’s hard to be erased. Childhood memories are the ones which linger around my mind. The very thought of some incidents amuses me when I look back. Some are so fascinating that you wish you could relive in them, alas they are the key to the past. Food always transports me back to those carefree childhood days, a true nostalgia!! Let me flip my memory book...yes.... I found something that will amuse you. It was years ago when me and my brother were in our teens. This happened when we were in Kerala. It was a weekend and my Mom wanted to go to the bank. As usual she prepared breakfast for us and some vegetable dishes for lunch. Lunch in our house was never complete without a fish curry or fish fry. The usual guy who brings the fish didn't show up and my Mom had to go. We were doing some chores. I had a good collection of roses and begonia in my garden, so I was in the front porch to check my plants. There came a lady with a basket full of fish and asked me if we need fish. Since Mom was not there, I didn't know, I went to the backyard and checked with my brother who was busy practicing his cricket skills. We decided to surprise Mom by buying fish. I had not much knowledge of fish; only few fish I knew were sardines, mackerel and prawns. I never liked fresh water fish, so never bothered to check them when Mom buys it. The lady asked us to call our Mom; we told her she was not there. It was not as bad as now to say things like that to strangers. She showed us what she got in her basket and soon she realized that these kids have no clue of what they are trying to get. She told us to get pomfret which is supposed to be a very tasty and expensive fish. 'Pomfret' that ringed a bell; I had heard the name and remembered eating the pomfret curry prepared in coconut milk several times, but I was not sure how it looked. Well the lady was authentically talking about the taste of this fish so we decided to get it. We used our pocket money and got the fish. It was the 'Now What?' moment when the lady left. We stared at each other and the fish in the earthen pot.’ After few minutes of contemplation with my brother, we thought to surprise our Mom even better by cooking it before she comes. Remember these are 2 teenagers who had never done anything like this before. We put the fish in the water and started to clean it, but it was very slippery. You can imagine the rest. We messed up the whole kitchen counter and we had spent lot of time on it already. Soon we heard the gate opening. Of course it was Mom; our plan to make the fish before she comes seemed to fall through the big dark holes of the drainage. She was calling my name since we were so quiet and she came to the kitchen's area. She was surprised to see us standing with a pot full of fish. She asked what we bought. We explained it was pomfret the 'good fish'. I still remember her face, not sure what was her emotion :). Finally we heard the unpleasant truth from our Mom's mouth that the 'good fish' we bought by spending all our pocket money was NOT POMFRET!!! What a bummer!!!!! We were tricked by the lady, it was some fresh water fish. To add on to the whole situation we made the fish so mushy trying to scale/skin and leaving it in the water for long time; the end result was a pot full of inedible fish. I am not sure what did my Mom do with it; she didn't make curry with it for sure :). Our effort, time and money were an utter waste. We learned our lesson, but when I think back it’s so funny and we still talk about our first encounter with 'POMFRET'. 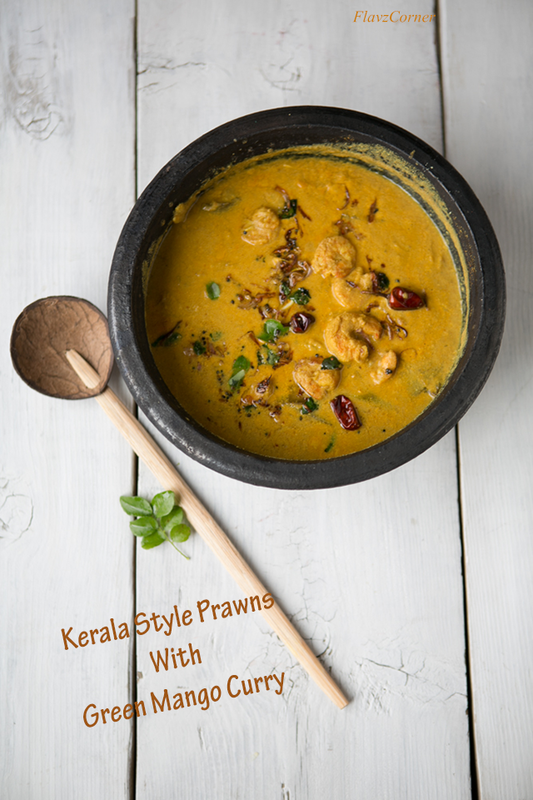 Here is a simple recipe for Kerala Style Prawns with Green Mango. It’s a favorite of mine. The green mango gives enough tanginess to the curry without adding fish tamarind. Since shrimp cooks so fast, it’s easy to prepare this delicious curry. This curry serves best with plain steamed rice. 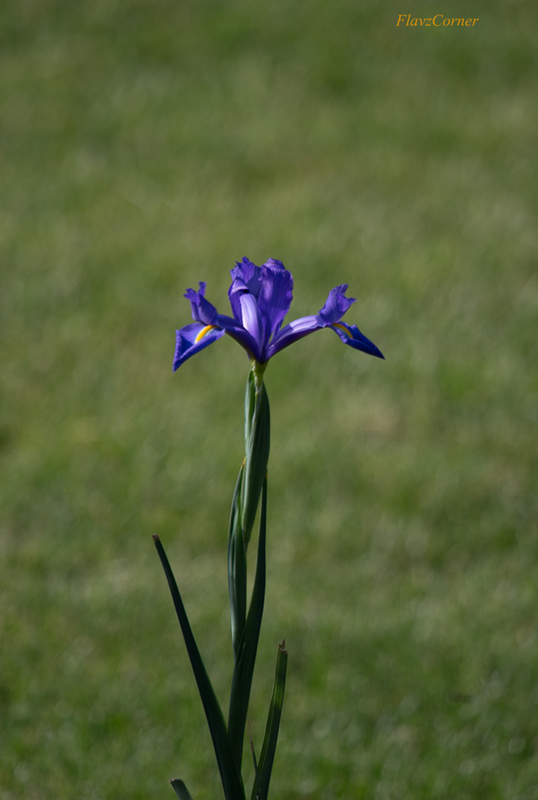 Just a random shot of the Iris from my backyard. Yes, we get frequent visits from deer and you can tell it by the leaves of the Iris. 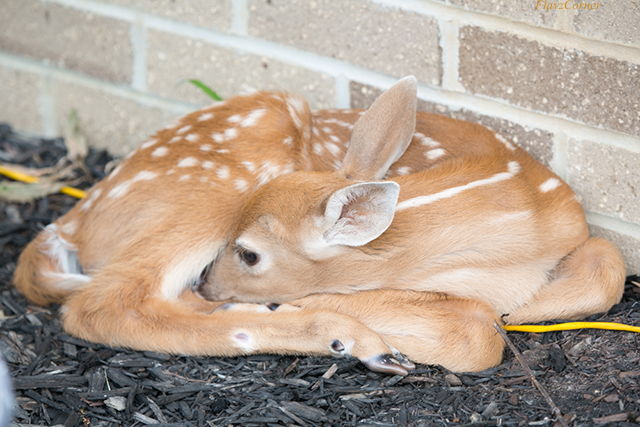 Another random shot of a baby deer found in our patio few weeks ago. 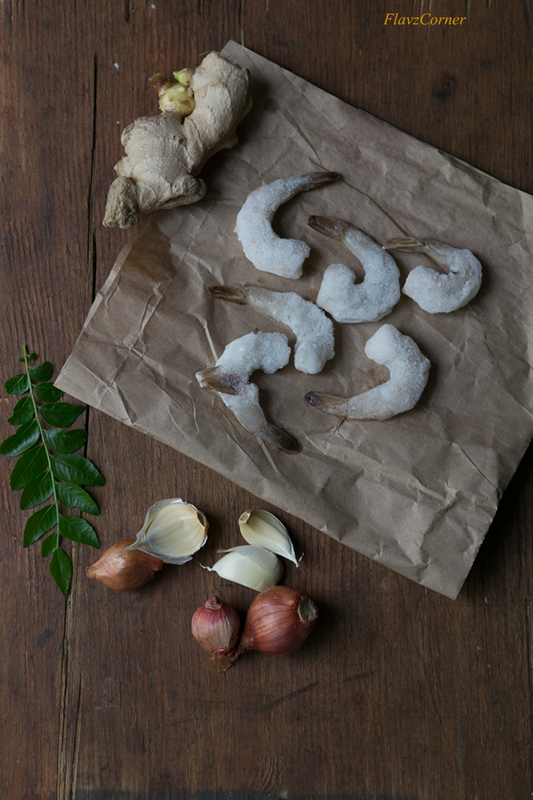 Wash the cleaned prawns with cold water and 1 tsp. of lemon juice to remove the fishy smell and keep it aside. Take a earthen vessel or a non-stick pan. Heat 2 tsp. of coconut oil and sauté the sliced shallots, garlic, ginger and sliced green chili. Cook till it turns light golden brown. Now add the turmeric powder, Coriander powder, Chili powder and fenugreek powder and cook on low heat for 2 minutes till the raw smell is gone. Add 1 1/2 cups of water, green mango, prawns and salt. Close the lid and cook for 5 - 10 minutes. Meantime grind all the ingredients from the list 'To grind' into a very smooth paste. Add the coconut paste into the cooked prawn. Add 1/2 cup of water and cook for 5 more minutes with the lid closed. Turn off the flame and let the curry sit in the earthen vessel for 5 to 10 minutes. Prepare the tadka in a non stick pan by spluttering 1/2 tsp of mustard seeds in 2 tsp of oil. Add thinly sliced shallots and dry chili and cook till it becomes golden brown. Add the fenugreek powder and turn off the flame. 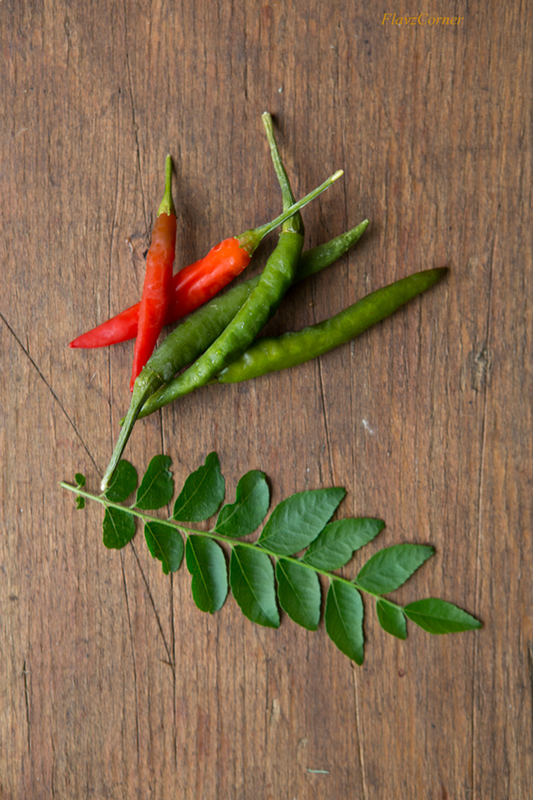 Now add the fresh curry leaves and mix well. 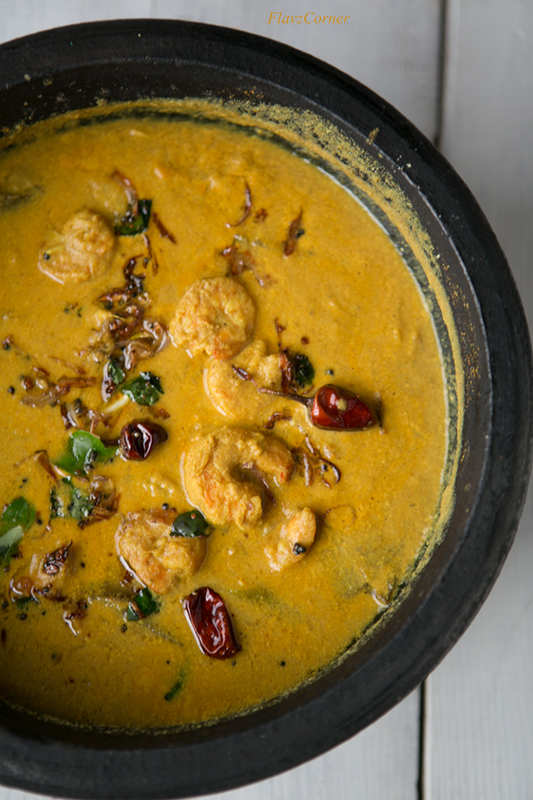 Pour the tadka over the prawns curry and enjoy it with plain steamed rice. Adjust the amount of green mango and green chili per your taste. I prefer tangy fish curries, so I used 1 1/2 cup of green mango which was good enough for our palate. Make sure that the coconut is ground into a very smooth paste, otherwise the gravy will not be great. This curry tends to thicken as it sits, so adjust the amount of water per your desired consistency. Prawn/Shrimp cooks fast and over cooking can make the meat rubbery. So make sure that you don't over cook the prawns. Earthen vessels are preferred for making Kerala fish curries as they enhance the flavor of the curry and provides consistent heat for even cooking. I adore prawns. Is green mango the unripe mango or another variety? Yes Angie, by green mango I meant unripe mango which is sour in taste. Chemminum mangayum reminds me of my ammachi. She used to squeeze one raw green chilli in the sauce before eating. We all use dot queue to get a taste. Her fingers creating magic in any curry. Thank you so much for bringing back memories Shibi. Awesome pictures as usual dear. Great story! Love the deer picture. And this recipe looks wonderful! Really good dish -- thanks. I am done with the dinner and the kitchen is closed.. I guess I need to go grab some midnight snack now since your post has left me hungry...perfect prawns curry to go with rice. Oh bless, sweet kids. I am sure Pomfret is the fish you always recognize now. I just love kerelan food. Coconut milk with curry leaves makes one of the best, most flavorful curries. Adding green mangoes with prawn is a great idea. I can imagine the mild tangy taste the curry would have. I absolutely adore green mangoes in curries. It infuses something none else can give. You know I love food from Kerala and this looks super yum. What a fabulous looking dear in your backyard.